Fried Gram halwa, is an Authentic Vysyas Recipe, made with fried Gram, Rice , Coconut & Jaggery as Ingredients.I am a big fan of this Halwa. I learnt this halwa from my Grand Mother. Fried Gram when blended with Jaggery,Rice & Coconut tastes yumm.Even the beginners can try this Recipe. Fried Gram(Putnala Pappu) - 1 cup. Soak the raw rice for 2 hours. 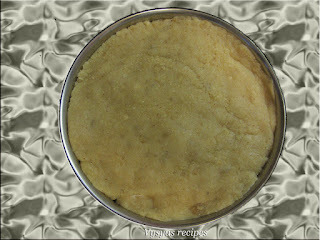 Grind soaked raw rice,fried Gram,coconut into a fine paste with needed water.Let the consistency be Moderate. if it is thick, it won't get cooked inside, if it is too watery it takes more time to cook. Heat the Ghee in a kadai, add the ground paste. Add the Grated jaggery, Mix well. stir continuously, until it leaves the sides of kadai. 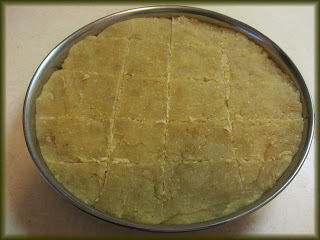 Transfer the halwa to the plate & level it. when it is little bit warm, draw lines into desired shape & serve.